Severe flooding at one of the main entrances to the town in Eastfield Road - near to the proposed 46 home development site. The road at of the main entrances to Louth has suffered severe flooding this morning (March 9) following heavy rainfall overnight, with residents concerned that a proposed 46 home development nearby could make the problem worse if it is approved. A Park Row resident sent in photographs of the flooding this morning. He said: “I have spoken this morning with some of the residents on this stretch of the road and they are again fearful of today’s flooding again entering their homes and garden areas. The proposed development would only compound the problem of surface water disposal. 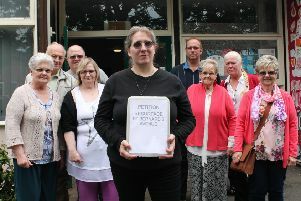 As reported previously, Eastfield Road and Park Row residents have repeatedly expressed their dismay at the proposed development, which they claim could cause chaos in terms of flooding, traffic, safety and privacy. The planning application was expected to be discussed at tomorrow’s ELDC Planning Committee meeting (March 10), but it has now been postponed and is expected to be considered on April 7 instead. • Update: An official flood alert has been issued for Louth area. For more information contact Floodline on 0345 9881188.